DEAR MAYO CLINIC: I recently was diagnosed with hepatitis C, and I am not sure of the next steps. Do I need to start treatment right away, and what does treatment involve? Can I still drink alcohol occasionally? Does hepatitis C always result in liver cancer? ANSWER: Receiving a diagnosis of hepatitis C can be distressing. The infection poses a risk of liver damage and, although rare, it may lead to liver cancer. Fortunately, thanks to recent advances in treatment, highly effective antiviral medication is available to treat hepatitis C. At this point, you should consult with a physician who specializes in liver diseases to help you decide how best to proceed with your care. Hepatitis C is a viral infection that causes liver inflammation. It is spread through contact with blood that's infected with the virus. Numerous factors have been associated with an increased risk for this infection, such as receiving a blood transfusion or organ transplant before 1992, injection of illicit drugs, and receiving a tattoo or piercing with equipment that is contaminated. People born between 1945 and 1965 have the highest rate of hepatitis C infection, and they should be tested for the virus. Most individuals diagnosed with hepatitis C have had it for years without noticing any symptoms. The virus doesn't trigger symptoms until it's started to damage the liver. 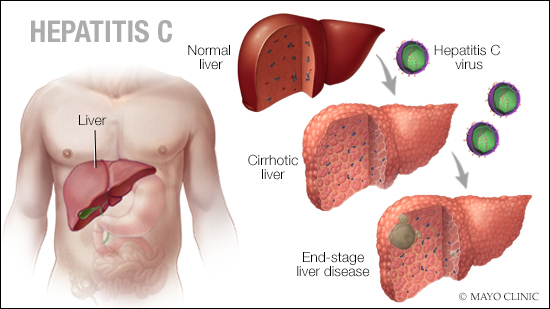 Progressive liver damage in the form of extensive fibrosis, or liver scarring, called "cirrhosis," occurs in about 25 percent of people with hepatitis C.
The risk of cirrhosis in people infected with the hepatitis C virus is higher among those who are obese and drink heavy amounts of alcohol. An occasional alcoholic drink is not thought to increase the risk of cirrhosis significantly. Individuals who develop cirrhosis as a result of hepatitis C have a 2 to 3 percent annual risk of developing primary liver cancer. Those with a lesser degree of liver fibrosis typically are not at increased risk for developing liver cancer. Even without the development of liver cancer, however, if hepatitis C is left untreated, liver damage may progress to the point that it causes loss of liver function. Eventually, that could lead to a liver transplant in a small percentage of patients. Because it's difficult to predict who will develop serious liver damage from hepatitis C, antiviral treatment is recommended for everyone diagnosed with the virus. The antiviral medication used to fight hepatitis C is effective in eradicating the virus. By taking a single pill once a day for eight to 12 weeks, a patient has a greater than 95 percent chance of being cured permanently. Clearing the hepatitis C virus from the body halts the progression of liver fibrosis and leads to regression of fibrosis in most cases. Side effects from the medication, when they happen at all, are minimal.